Start time of the Air Products 10K on Sunday is 9:30AM and not as shown on the NSRRA fixture sheet. 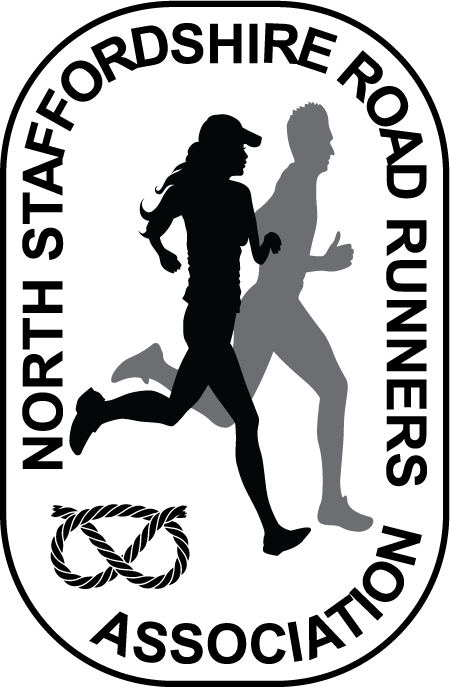 North Staffordshire Road Runners Association was set up in July 1974 to promote road running in the North Staffordshire region. Members are organised into groups based on ability. There are seven mens and four ladies groups. There are also leagues for different age groups 40 to 44, 45 to 50 etc. Each year 20 races are chosen to go into the NSRRA programme and the best 12 performances in these races count towards the league competition. In each of the events the 1st, 2nd, 3rd, 4th etc in each group receives 50, 49, 48, 47 etc points. Click here for Bryan Dales phots. Breezy conditions greeted the runners for race number 4 – the Newcastle 10K. Race winners were Felix McGrath and Rebecca Twardlocheb of the host club. First home for NSRRA were Carl Moulton of Boalloy and Nia Nokes of Stone Master Marathoners. The guest group for Newcastle 10K as drawn by Jo Stanfield of Trentham Running Club is group M.
The Group M winner at Newcastle 10K for the featured group is Julia Stokes. NSRRA are strongly advising that runners do not wear headphones. This can be dangerous as you cannot hear marshalls instructions. With most courses not closed to traffic you need to hear what is going on around you. You also risk disqualification as some races operate this policy.